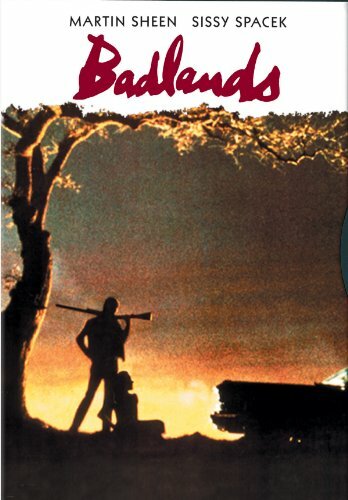 For this "Movie of the Week", I go back to the beginning of a famed filmmaking career with Terrence Malick's "Badlands". Released in 1973, this film is loosely based on a real-life murder spree carried out by a young couple in Dakota. Focusing intently on this pair of characters (played by Martin Sheen and Sissy Spacek), the story provides Malick's most focused narrative to date. As we are introduced to these eventual criminals, we immediately get a sense of dread, foreshadowing the ill consequences to come. It goes without saying that this film has Malick's trademark brilliant cinematography, but here I found other elements that drew my attention. Along with the visuals, the mood is also evoked through music, with a subtlety that is chillingly effective. The biggest surprise however is the writing. This is one of the most complete, rich scripts to come from any filmmaker, which makes it all the more impressive coming from Malick's decidedly visual-minded ouevre. 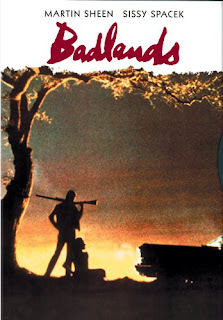 Unlike his other films, "Badlands" is plot-driven with a clear 3-act structure, making it very accessible. More importantly, the characters are richly developed with full character arcs. This lack of ambiguity is a welcome change from Malick's recent work. Specifically, we have the naive curiousity of Holly (Spacek) and the wild confidence of Kit (Sheen). Holly is a slight 15-year old, enchanted by this handsome older figure who promises her a more exciting life. As she goes on this adventure with the 25-year old Kit, she becomes a fascinating proxy for the audience. Like her, we are initially allured by this James Dean-esque bad boy. In fact, thanks to Sheen's down-to-earth appeal, it actually takes a while to accept that you are indeed watching a cold-hearted serial killer. Of course, Holly soon becomes aware of the dire consequences of his actions and as a result receives a rude awakening. As she realizes how much she has thrown away (Kit has killed her only family) for little benefit, the film becomes a unique coming-of-age tale. Despite the thrill of romance, Holly is smart enough to understand that love is not enough. Much of her thoughts are communicated through excellent use of voice-over, allowing us to fully engage with and understand her character. Even though their murderous ways are horrifying, it's easy to see how she would get caught up in this crazy ride. It's a testament to the power of love and misguided ambition. 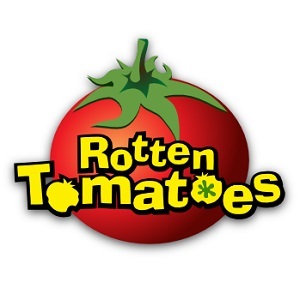 In my overall analysis of this film, I was hard-pressed to find any faults. For my money, it's Malick's best film to date and one of the best debut feature films in cinematic history. Great pick, love this one! My favorite of the two Malick movies I've seen is The Tree of Life but I'm excited to see the other (two?) movies as well. Thanks. If you liked Tree of Life, then I would recommend The Thin Red Line first. Great review. There really are no faults with it are there? Really cool to hear that it's your favorite Malick. That's always a tough call for me, but this one is damn close. However, it does not fall behind in-terms of movie collection, because it is always being updated from time to time.